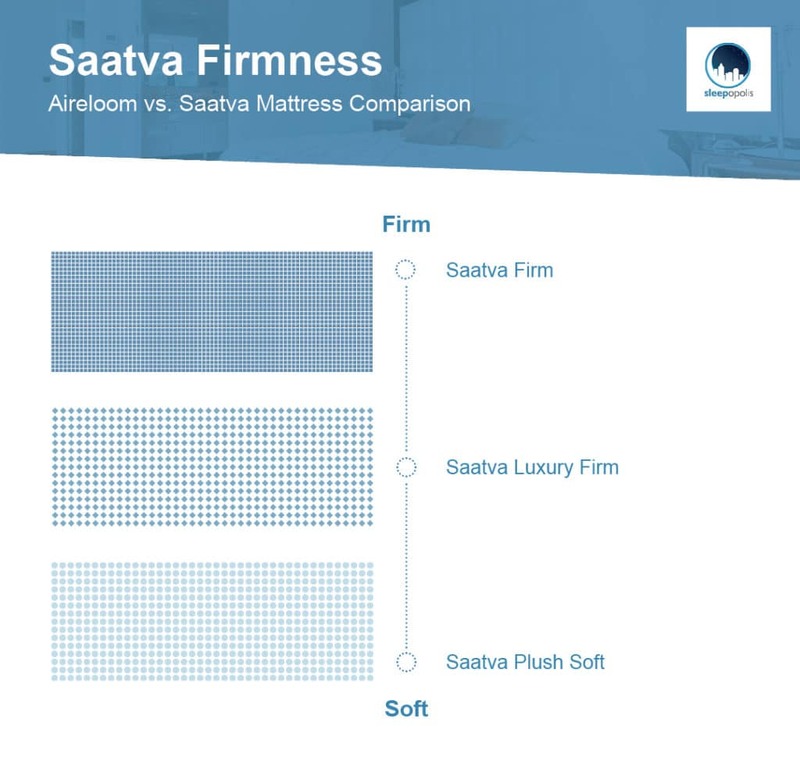 Aireloom and Saatva are two mattress companies that specialize in luxury models, put an emphasis on American, handmade design, and are constructed with both innersprings and varying foam layers. While Aireloom will stop at nothing to provide its sleepers the best materials and manufacturing techniques, this also means it comes with a hefty price-tag, with some mattresses easily moving into the $5,000 range. On the flip side, Saatva prides itself in creating “America’s most-affordable luxury mattress,” with online prices often under $1,000. Meanwhile, they both focus on coil systems, whether it’s Aireloom’s use of nested and micro coils, or Saatva’s distinctive “coil on coil’ structure. Continue reading where we’ll break all the details down, from construction to feel, price to trial periods. Learn which mattress might better suit your needs and be a great fit for the bedroom. Aireloom is a California brand, owned by E.S. Kluft & Company, that exclusively makes and sells mattress (and one pillow!) in retailers across the US. It might be most well known for its patented ‘Aireloom lift,’ an air chamber that increases the areas of low pressure when you’re laying on the mattress, making you feel like you’re on top of the bed while simultaneously being cradled. There are five different mattress collections within Aireloom, and each collection offers different comfort levels. In total, Aireloom currently offers 27 different mattresses, though it’s unlikely all 27 will be available at a retailer near you. Moreover, since you can’t buy these beds online, and it seems as if Aireloom updates its collections quite frequently, trustworthy, third-party reviews of Aireloom are less prominent online. 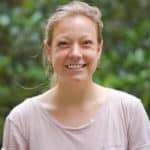 In other words, if you’re a potential buyer, there is more responsibility in your hands to find and talk to a retailer to see for yourself if the mattress fits your needs. 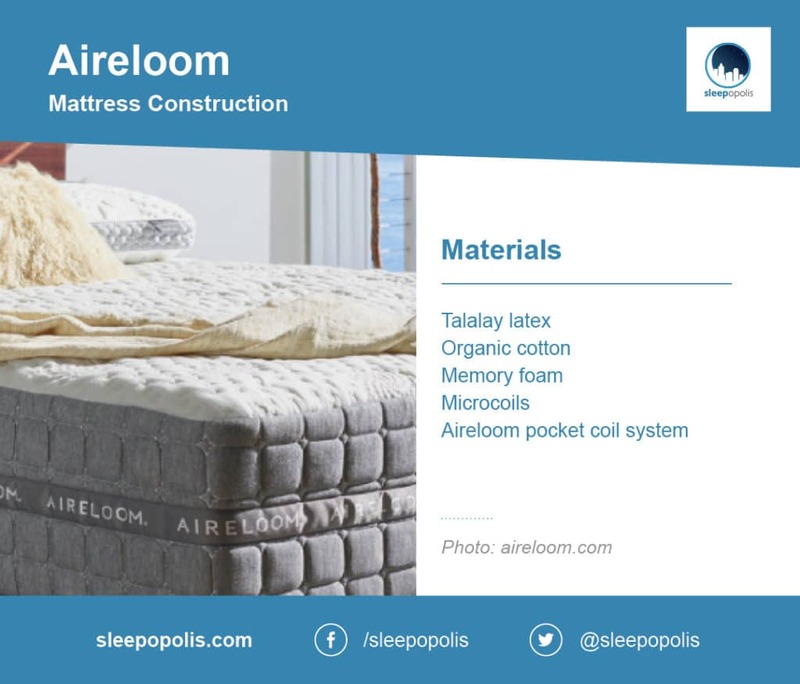 All Aireloom mattresses are constructed slightly differently, but they all do follow a general theme: foam, cotton, and/or other soft and plush layers in the comfort layer, followed by an innerspring system. Talalay latex is the most common top comfort layer among Aireloom mattress models. Talalay is a natural and soft latex foam that helps the body maintain a consistent body temperature throughout the night. Then typically comes a layer of organic cotton followed by a layer of memory foam for extra body contouring. Then come the micro coils. These are typically found at the base of the comfort layer, but you could also think of them as being between the comfort layer and the mattress’s innerspring system. These micro coils are made from thin and flexible steel coils that offer additional pressure relief, comfort, and also have a high level of durability and are not prone to body impressions. Below that is Aireloom’s pocket coil system, which is synonymous with individually wrapped coils. Pocket coils are individual fabric wrapped coils that are designed to minimize friction and maximize strength. The coils provide a consistent distribution of support and good motion isolation. Aireloom uses higher gauge pre-compressed pocket coils in some models for a firmer feel, and a thicker lower gauge coil in other models for something a bit softer. Both types of coil gauges, according to Aireloom, are made exclusively for the high carbon steel coils that are heat tempered. Additionally, the pocket coils are going to provide that specific, slightly bouncy sensation of innerspring mattresses. The Aireloom mattresses have four different support systems, depending on which model you choose. There is the wood stabilizer, which is upholstered in heavy-duty foam and is designed to provide rigid support for foam cores. Another option is a semi-flex support system, which is constructed in a “V” shape with an interlocking grid design. As the name suggests, it provides a subtle ‘flex,’ and is great for innerspring mattresses. The True flex ™ foundation provides more “flex,” and the “8-way hand tied” foundation is an all coil foundation with 8 ¾ gauge coils that utilizes Italian twine. If you want something firm, medium-firm, or super soft, Aireloom has the mattress for you. Almost every collection comes in a plush, luxury firm, or firm option. Some even come in extra firm. If you dive into the actual specs, you can learn which models use memory foam for extra contoured support, which has extra layers of latex or other foams, and how the beds are stitched, which leads to different feelings of edge support. 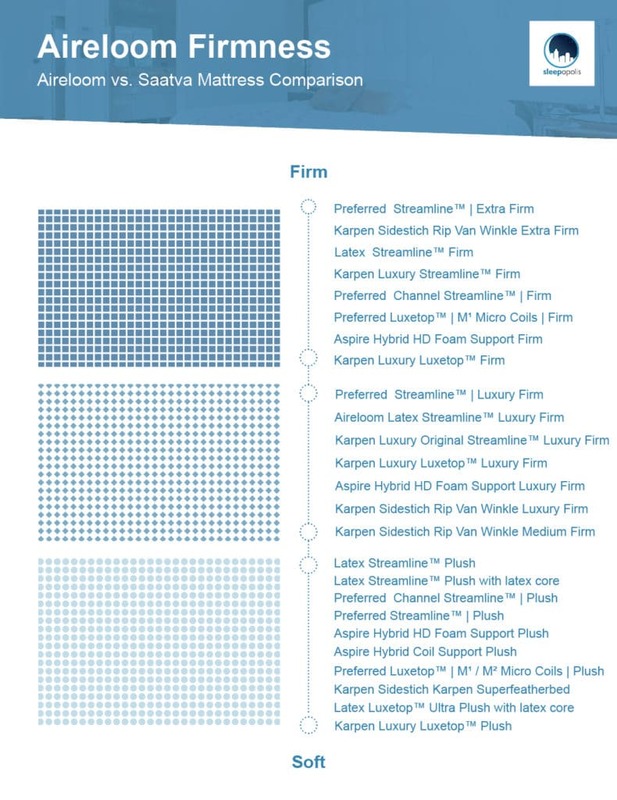 Here’s a breakdown of the firmness level of each individual Aireloom mattress. As a general rule of thumb, A Luxetop™ mattress provides extra room at the top of the mattress which is filled with plush, comfort materials for a softer feel. A Streamline™ mattress is a more plain style with less padding to provide something more firm and sturdy. As for support, all Aireloom beds are known for its edge support, ability to isolate motion and to cradle and “lift” your body with the Aireloom lift technology. A few mattress models include labor-intensive side stitching or other handmade construction techniques to provide an extra feeling of durability and support, especially on the edge of the bed. And while spring mattress doesn’t have the best reputation for having good motion control, Aireloom’s specific coiling technique helps isolate movement. This is because the mattresses use double knotted offset coils where the ends of each coil are looped and double knotted, creating an hourglass shape. This feature, combined with the gauges used in their individually wrapped coils, provides a resilient structure the prevents motion transfer. Finally, the Patented Aireloom Lift™ aims to provide a feeling of weightless, and truly makes you feel like you’re sleeping “on top” of the mattress versus sinking into it. Exact prices are not available online for Aireloom mattresses. We do know that they range from right under $2,000 to an upwards of $7,000 depending on model and size. Make sure to talk to a retailer, test out different mattresses, and understand what’s best for you before making the investment! Saatva is a mattress in a box with a twist: it’s a traditional innerspring mattress. Saatva focuses on its coil technology that aims to provide sleepers with a better traditional mattress, but shipped in a box to provide convenience for customers. The company started in 2010 and was one of the first online innerspring mattress retailers that sold multiple mattress types that would appeal to different comfort level preferences. In addition to the Saatva innerspring mattress — which we’re looking at today — the company also sells memory foam mattresses under the brand Loom & Leaf and latex mattresses under the brand Zenhaven. Saatva’s secret sauce is that they encase each mattress’s upper coils in foam to prevent sagging and provide an innerspring feel with the comfort and cradling of foam. Saatva technically has “one mattress,” that comes in three different comfort levels: plush soft, luxury firm, and firm. Let’s look at the construction now. 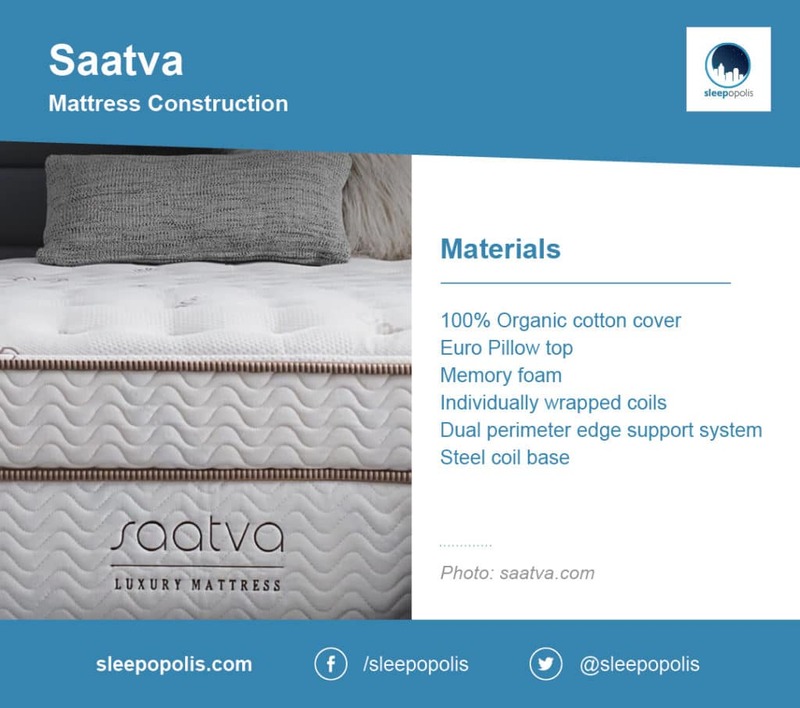 The Saatva mattress construction follows a formula, though the different comfort options mean they use different types of foams above the innersprings to provide a softer or more firm feel. Each mattress has a cotton cover, layers of foam, edge support, and individually wrapped coils. The cover is made with 100% organic cotton and is quilted with foam to create a Euro-style pillow top for plush pressure relief. Right under the cover is a layer of foam for additional relief on key pressure points, like shoulders and hips. The plush mattress version uses softer and conforming foams while the firm mattress version uses firmer foams. The foam has a convoluted design to help air move through it and prevent the foam from trapping heat. Now comes the coils. The individually wrapped coils Saatva uses aim to provide the sleeper with both support and bounce while helping to isolate motion. After the individually wrapped coils come the support layer, which is made of steel coils. This creates Saatva’s famous “coil on coil structure.” The lower coil unit, like Aireloom, has a connected hourglass shaped steel support base for edge support and extra resilience. As for the base, the Saatva base is made of a high-density poly foam that wraps around the coil layer for edge support. This is also what the coils rest on, helping the entire mattress retain its shape and provide supportive and durable pressure relief. As you can probably guess, the plush soft mattress is the softest version, followed by luxury firm for a medium-firm comfort, and extra firm for something super sturdy. In general, however, here are some themes about the overall feel and support of the Saatva mattress. First is the fact that Saatva prides itself on providing the classic feeling of a coil mattress with extra support by also using foam. The coil-on-coil structure with the quilted foam cover provides bounce and pressure relief, and many say offers “the best of both worlds” when it comes to spring and foam beds. Moreover, the top layer of coils — the individually wrapped ones — respond quickly to pressure and keeps your back in a good position, helping to alleviate aches and pains while protecting various pressure points on the body. Lastly, the two layers of coils also make you feel like you’re on top of the mattress, even while the foam provides you a bit of plush support that lets you sink in a bit. Many say you don’t feel “stuck” in a Saatva. For what it’s worth, this bed also does a good job at providing edge support and isolating motion — just read the Sleepopolis review where we put the mattress to the test! Warranty: There is a 15-year warranty on the mattress. 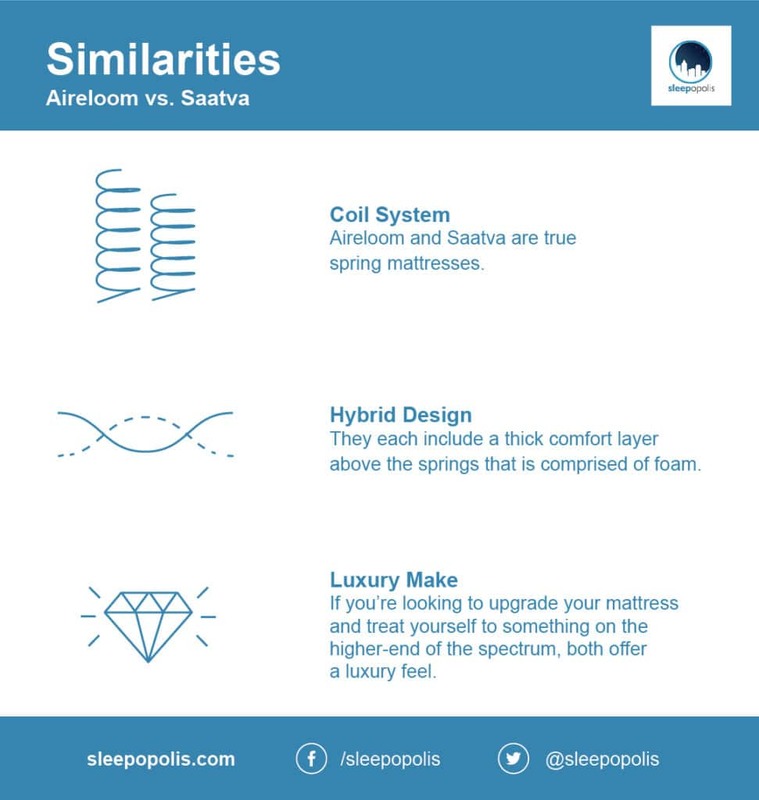 Coil system: Aireloom and Saatva are true spring mattresses and provide a good amount of bounce and durability. Both brands use individually wrapped coils and, overall, a thoughtfully designed coil system to provide ample resilience and support. Hybrid design: While Aireloom and Saatva aim to provide a true innerspring feel, they each include a thick comfort layer above the springs that is comprised of foam. The foam layer provides that luxurious, plush feel, and each brand has different firmness levels so you can pick the exact level of support you want and need. Luxury-make: Both brands market their mattresses as being luxurious, using super comfy materials, high-end design, and meticulous construction. If you’re looking to upgrade your mattress and treat yourself to something on the higher-end of the spectrum, both offer a luxury feel. Coil system: Yes, the coil system has made its way to both categories! While each mattress uses coils, they are slightly different in design. Aireloom has one layer of pocket coils with micro coils right above it (which they technically say is “in” the comfort layer) while Saatva features a double coil structure separated by a thin layer of foam. 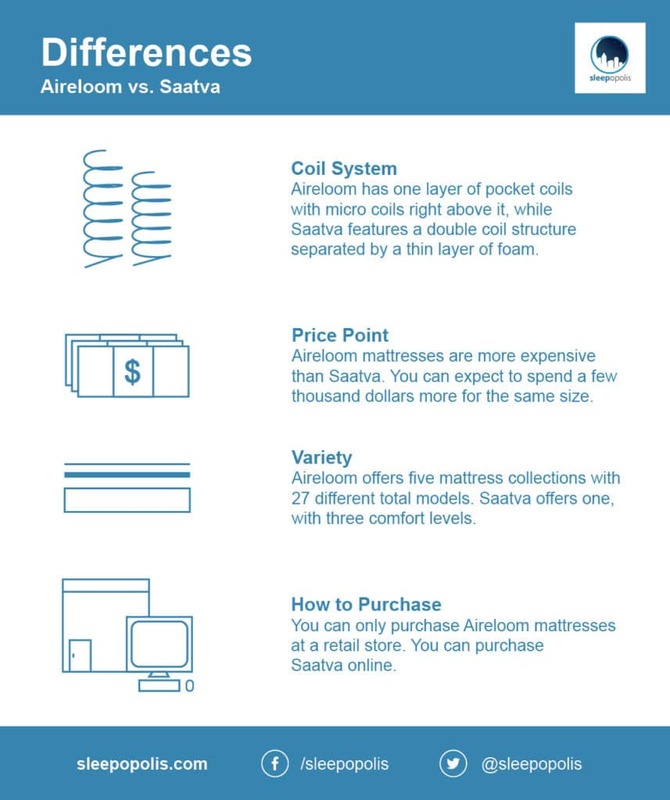 Price point: Aireloom mattresses are more expensive than Saatva. While a Saatva Queen retails at $999, you can expend to spend (at least) a few extra thousand dollars for a Queen-sized Aireloom. Variety. Aireloom offers five different mattress collections with 27 different mattress models in total. Saatva offers one mattress, that comes in three different comfort levels. How to purchase. You can only purchase Aireloom mattresses at a retail store. You can purchase Saatva online. If you’re looking for an innerspring mattress that utilizes some foam and focuses on luxury, you can’t go wrong with either of these options!